Today is the day you have all been waiting for! It is our very first challenge! We will be a two week challenge. allow you to use any image and any chalk. OUR IMAGES and OUR CHALKS. but you MUST use chalk somewhere. colors will vary on sets. Where's the chalk? 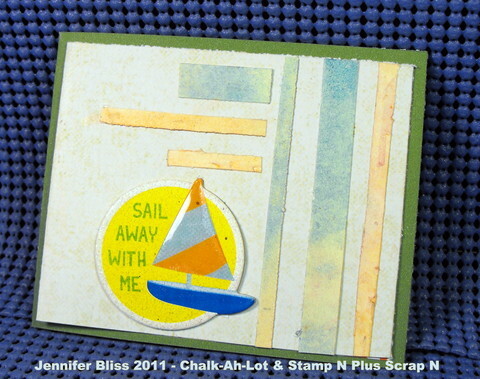 You ask...I used chalk - dry - brushed on - direct to paper - in the strips of paper to the right and above the SAIL AWAY WITH ME Embellie. I have had so much fun with the chalks - they are so versatile and I will be posting many more projects very soon! 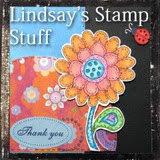 Remember to swing by the blog and participate - you just might be our winner! THERE ARE PRIZES AT STAKE!!!! Love the card Jenn, sounds like a fun challenge! Great project, I love that you are on this team!